Students are introduced to the concepts of supply and demand. They will construct a supply and demand graph, compute the equations of the lines, utilize a system of equations, and solve the system by the substitution method to confirm the equilibrium point. Define supply, demand, law of demand, and equilibrium. Construct a supply and demand graph. Compute the equation of a linear demand curve. Compute the equation of a linear supply curve. Compute the intersection of the supply curve and demand curve (confirm the equilibrium price and quantity) using a system of equations. Episode 1: Supply from the Federal Reserve Bank of St. Louis’ Economic Low Down Video Series – Stop the video at 2:08. Episode 2: Demand from the Federal Reserve Bank of St. Louis’ Economic Low Down Video Series – Stop the video at 2:44. Episode 3: Equilibrium from the Federal Reserve Bank of St. Louis’ Economic Low Down Video Series – Stop the video at 3:15. Which statement best describes the relationship between price and quantity supplied? As the price of a good increases, the quantity supplied decreases. As the price of a good decreases, the quantity supplied increases. As the price of the good decreases, the quantity supplied remains unchanged. What is the formula for the equation of a line? Distribute a copy of Activity 4 to each student. Instruct students to use the data to graph the supply and demand curves, find the equations of the lines, and use the system of equations to confirm the equilibrium point. Grade student work using Activity 4 Answer Key. Supply and demand is the meat and potatoes of all economic analysis. In this lesson students will get an introduction by creating equations and graphing them to find the equilibrium points. They will have the opportunity to put their Algebra 1 math skills to work in a real world situation by mathematically determining the equilibrium price and quantity using a system of equations. Distribute a copy of Activity 1 to each student. Give students a moment to review the questions. Explain that they will fill in the blanks as they watch a couple of short video clips. Reinforce these concepts by showing Episode 2: Demand from the Federal Reserve Bank of St. Louis’ Economic Lowdown Video Series: Episode 2: Demand. (Only show video through 2:44. The remainder of the video is beyond the scope of this introductory lesson). Review the answers to the demand portion of Activity 1 using Activity 1 Answer Key. Explain that typically, as the price of a good or service rises (or falls), the quantity of that good or service producers are willing to produce and sell increases (or decreases). Reinforce these concepts by showing Episode 1: Supply from the Federal Reserve Bank of St. Louis’ Economic Low Down Video Series: Episode 1: Supply (Only show video through 2:08. The remainder of the video is beyond the scope of this introductory lesson). Review the answers to the supply portion of Activity 1 using the Activity 1 Answer Key. Demonstrate the law of demand, explaining that each student has $10 to spend on brownies. Draw a chart like the one below on the board. 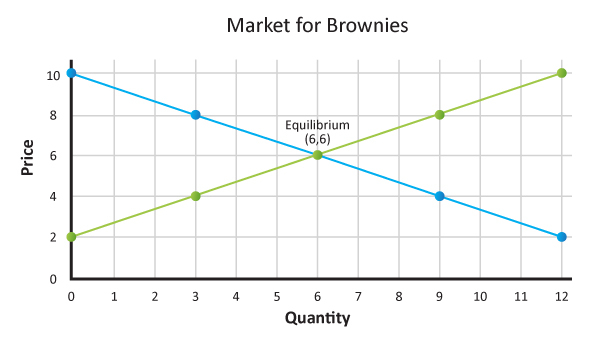 Ask the students: "How many brownies are you willing and able to buy at each of the following prices?" Create your own demand schedule based on the number of brownies students are willing and able to buy at each price (Note: it is acceptable if the demand schedule is not linear for this section of the lesson, but is better if consistent). Ask what the relationship is between prices and quantities demanded. [Indirect or inverse relationship – as the price increases, the quantity demanded decreases and, vice versa, as the price decreases, the quantity demanded increases.] Remind students that this indirect relationship is known as the law of demand. Distribute a sheet of graph paper to each student. Have students follow along and graph the demand curve as you draw the curve on the board. Draw a demand curve as a downward sloping line using the data provided by the students. Reiterate the indirect relationship between the two variables – price and quantity demanded. As an example, here is a graph of provided data. Ask how we describe a relationship like the one we see between the price and quantity supplied. [Direct or positive relationship – as the price increases, the quantity supplied increases and, vice versa, as the price decreases the quantity supplied decreases.] Explain this is consistent with the concept introduced in item #8 above. Ask students to plot the data from the supply schedule and draw a graph on their graph paper. Draw a supply curve on the board as an upward sloping line using the data from the Supply Schedule above. Reiterate the direct relationship between the two variables – price and quantity supplied. As an example, the graph of the provided data is below. 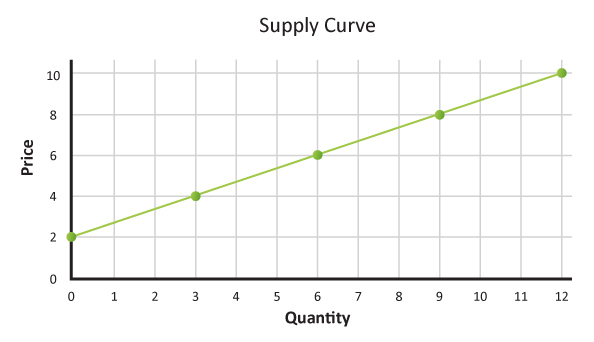 Ask students to draw a supply curve on the same graph as the demand graph they drew earlier in step 14. Point out the intersection of the drawn supply and demand curves. Ask students what this represents. [Answers will vary. Some students may realize that this is the point at which the quantity supplied equals the quantity demanded.] Show Episode 3: Equilibrium from the Federal Reserve Bank of St. Louis’ Economic Low Down Video Series found at www.stlouisfed.org/education_resources/economic-lowdown-video-companion-series/episode-3-equilibrium/. Stop the video at 3:15. Explain that typically as the price of a good or service rises (or falls), the quantity of that good or service producers are willing to produce and sell increases (or decreases). Tell students they are going to use what they have learned about supply and demand to mathematically confirm the equilibrium price and quantity. Review how to compute equations for a linear function using data from a function table. Once you have the slope and b, which represents the y intercept, you enter the slope and the intercept into the function for the line. Distribute a copy of Activity 2 to each student. Explain that they are to utilize Activity 2 and work along with you as you solve the problem. Guide students through the process of using the slope intercept form and the substitution method for systems of equations to confirm equilibrium. First graph the supply and demand curves, then find the equation of the lines. Review answers using Activity 2 Answer Key. Distribute a copy of Activity 3 to each student. Give students time to work through the problem in class. Review answers using Activity 3 Answer Key.